The Consumer Price Index rose 2.4% in March compared to a year ago. Rising prices were seen in Hotel rooms, apartment rentals, and hospital cost. The US has had almost no inflation for the past decade until recently. The Federal Reserve wants to keep the inflation rate generally right around 2% to fight deflation though it's been well below the desired rate for the past decade. 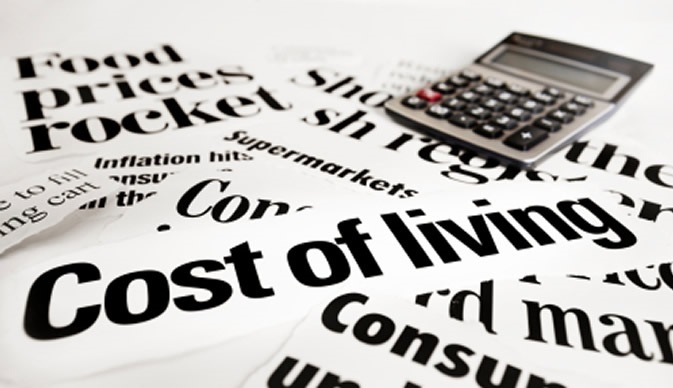 One of the many fears many people have nearing retirement is outliving their money or not keeping up with the cost of living. This problem can be easily solved by linking your retirement income to an index that moves up with inflation and is locked in annually. The same can be said for someone who just wants to accumulate and grow their money but at the same time not participate in volatility or risk. So what would cause someone not to take advantage of something that can achieve safety of principal, income for life, and inflation protection? The reason is that it involves a dirty word that is hard to understand and brings out negative feelings based on misinformation and that word is ANNUITY. There are many variations of annuities offered by insurance companies and there is no end to advisers or insurance agents pushing them. One of the many problems people have when they hear the word annuity stems from the adviser or agent not explaining how the annuity works correctly, recommending the wrong annuity for the objective or not adding the right rider or adding the wrong rider to cover their client's needs. When making a recommendation of an annuity contract or a combination of contracts many things have to be taken into consideration like are we solving for income or a death benefit or both, time horizon, minimum income needs by what date, solve for RMD's, solve for single income or joint income. The adviser or agent should be able to show you the last ten years net returns or the worse case scenario and all the pros and cons. The adviser or agent should be independent and able to work with any insurance company to find the right solution for their client's needs versus a captive agent or adviser who can only recommend products their company offers. The adviser or agent should be knowledgeable enough to find the solution to the clients objective and at the same time be able to tell a client when it's inappropriate to use an annuity for their objective. Below is a list of just some of the objectives or scenarios and the type of annuity that should be considered. Income for Life: A Fixed Index Annuity (FIA) can create an income for life like a pension. An FIA is not a security like a Variable Annuity (VA) is. This contract is linked to the performance of an index without the risk though you're are not actually invested in the index. Most FIA's have a fixed income once activated though there are a few A+ rated companies that have an increasing payout option which moves up as index credits are added to the contract. This option is wise to consider if there is a long time horizon that the income is needed to fight the effects of inflation. Sometimes an income rider is advantageous if deferring income for many years though there are many FIA's where you can start income immediately if over age 59 1/2. FIA's have low fees and in many cases have no fees at all unless a rider is added. Accumulation/Safety: An FIA can be used for accumulation and growth without any risk to the principal. In this scenario, you would not want to add any income rider since the focus is on the death benefit or the contract value and the ability to access funds as needed since most FIA's allow you to withdraw up to 10% annually during the surrender period. The more attractive indexing options if available for this objective would be a participation rate from 100-180% or higher with no cap. If the contract is an IRA and RMD's have to be taken the adviser or agent can set up automatic withdrawals monthly, quarterly or annually to cover the RMD's. The insurance company will calculate what the RMD is annually and any interest earned based on the index will be locked in offsetting any RMD's that must be taken. Immediate Income/Period Certain with Life: For this scenario, a Single Premium Immediate Annuity (SPIA) can be considered depending on income needs and the age of the annuitant. This type of annuity usually has the highest payout. Period certain covers a specific period for example 10 year period certain with life means if the annuitant passed away during the 10 year period certain the remaining balance of what has not been paid out goes to the beneficiaries. If the annuitant lived past the 10 year period certain then the income would continue for life but there would be no value left in the policy since the original premium has already been paid out. One thing to remember is that a SPIA is paying mostly principal back at first and has no growth element to it. It is a very useful tool when applied correctly in covering specific needs that must be covered and is usually used with older individuals. CD Alternative: If you're looking for just a straight fixed interest rate similar to a CD then a straight Fixed Annuity or Multi-Year Guaranteed Annuity or MYGA may be appropriate. MYGA's generally pay a higher interest rate than a comparable CD and in most cases, you can have the interest paid out to you annually or monthly. These are just some of the scenarios that can be solved using a specific type of annuity. There is no one shoe that fits all when it comes to your retirement and everyone has different needs that must be addressed. An adviser or agent should be able to design a plan to fit your needs using the guarantees offered by the insurance industry. When it comes to financial planning there is no other place where you can get the same guarantees that are offered in insurance contracts.